A few weeks before ski season reached full throttle, my niece, daughter-in-law and I decided to explore southwest Vermont. As we drove from one small town to the next, the brownish Green Mountains loomed on either side, with snowy rivulets occasionally snaking down the inviting slopes. Something about this view made the drive cozy, as though we were cocooned inside something very small. Or maybe it was just knowing that wedge-shaped Vermont is very small. Only 158 miles at its longest and 90 miles at its widest, a lot can be seen in a short time, including some of the state’s 100 covered bridges. With Suzanne (my niece) driving up from Massachusetts and Shannon and I coming in from Albany, we met at the popular Blue Benn diner in Bennington. After a long wait (which we’d been warned about), we were able to take a booth and thoroughly enjoy breakfast —cranberry walnut multi-grain pancakes for me, and eggs, toast and hash browns (the best Shannon had ever eaten) for her and Suzanne. While the Bennington Battle Monument, the tallest structure in the state, and the Bennington Museum were already closed for the season, stores in town were open, so we wandered the main street, stopping in gift shops, an art supply store, thrift shops, a health food store and a pharmacy. The Hawkins House craft market and gallery up the street from the diner was the best, with finely crafted jewelry and a broad inventory ranging from chatty oven mitts (“I hate everyone, too”) to blown glass, pottery and Vermont products. But I also appreciated finding a well-stocked art store, Jay’s Art Shop and Frame Gallery on South Street, so I could buy drawing pencils to tuck inside the Christmas gift bag Suzanne would deliver to her mom. Our stroll also took us to Congregation Beth El, the town’s synagogue. Dedicated in 1923, it fell into disrepair in the late 1960s, and was then revived in the late 1980s by three people, including one who’d fled Nazi Germany in the 1930s. When we climbed the steps to read placards near the doors, a woman came up behind us, lamenting that the doors had to be locked—they’d received threats after the October massacre at a Pittsburgh temple. She knocked on the door, a man in clerical garb opened it immediately, and before going in, the woman thanked us for admiring her synagogue. Further off the beaten path, but not too far, is Bennington Potters on County Street. The town is known for the distinctive handmade stoneware produced there. The exterior and numerous showrooms provide plenty to see, including one of the distinctive, six-foot-long painted catamounts (mountain lions) installed around town; two black cats lolling in a double cage; and myriad pottery and non-pottery items. I ended up buying maple candy for my husband. We were, after all, in the land of maple syrup. After shopping, it was time for lunch and checking out the mountains. Suzanne had previously been to Prospect Mountain in nearby Woodford and liked the accommodations for low-skill cross-country skiing. Most of Prospect’s trails have a skating lane in the center with cross-country tracks on either side, and there are special snowshoeing trails, so it’s perfect for beginners and experts. The Mountain Trail is great for those who want to climb more than 400 feet, see the valley below and enjoy a downhill adventure. A similarly small resort is Bromley Mountain Resort in Peru, which is popular with local residents and was among Vermont’s first recreational skiing sites. It’s user-friendly and faces south, so it’s among the sunniest of the slopes you’ll find. Both children and adults can get skiing and snowboarding instruction, and it’s so accessible that you can see the length of the slopes from the road. The Lodge at Bromley is on-site, but if that doesn’t suit your needs, there are various other accommodations nearby. We saw Bromley on our way to Stratton Mountain, which has the highest peak in this part of the state, at 3,875 feet. There are trails for every level of skier. When we drove up to see it, I was struck by how much it resembled an Olympic ski village. Parking lots were teeming, and skiers were already out and headed toward whichever trail appealed to them. Stratton’s terrain, lifts and snow condition earn it national rankings virtually every year. 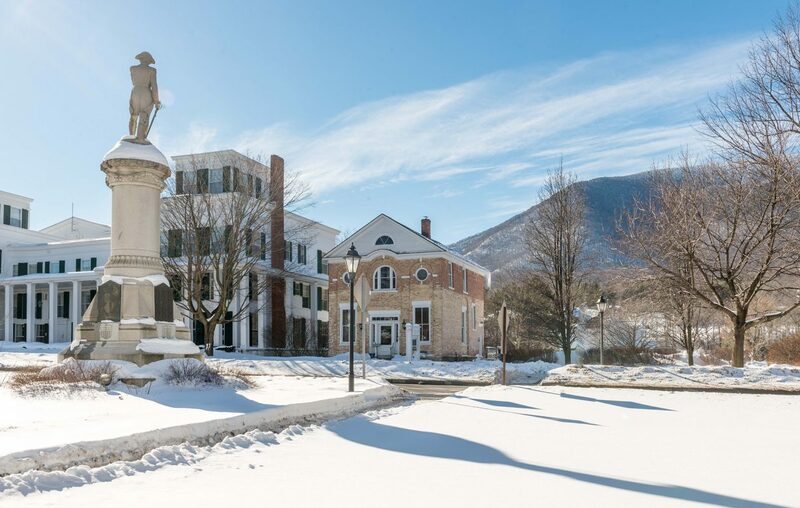 Also making it popular with skiers are the attractions in nearby Manchester: Outlet shopping and plenty of places to stay (check out the Taconic hotel). As we drove through we could see why shopping is so popular here. Downtown Manchester is lined with stores ranging from Michael Kors to Eileen Fisher and Johnston & Murphy. Restaurants also abound. We happened upon Seasons on Main Street and were glad we did. At this comfortable, pub-style venue Shannon enjoyed the Vermonter, ham and sharp cheddar cheese with an apple and fig jam on raisin bread. Suzanne and I were happy with our choices, too: the Maple Roasted Pear and Arugula Salad and Power Quinoa Salad (kale, spinach and arugula with roasted chickpeas, tomatoes, avocado with a pesto cashew dressing), respectively. Obviously, there’s far more to winter sports in Vermont than the slice we visited. Other top ski resorts within an hour and a half of Stratton include the Mount Snow, Killington and Okemo Mountain resorts. The best known, Stowe, is a three-hour drive, but if you’re heading there for a week’s vacation, why not split your time and have a blast?